When you land in the Lisbon airport, there’s a heightened anticipation for what comes next. There’s the usual ritual of waiting in line, searching for your luggage, going through customs, all transforming you from in transit to landed. But here, arriving isn’t the best part. You drive out of the airport towards the river Tagus. As you get close, you first see the seagulls. Then, you see the Tower of Belém and the Jerónimos Monastery, monuments to the many “caravelas” that departed from a nearby dock. A marble Henry the Navigator leads a pack of explorers, pointing the way to the new world. But that’s not why you came here. You came here for a small pastry shop just down the road. In 1834, the government closed down all Portuguese convents and monasteries. The friars of the Jerónimos Monastery needed a source of income. So, like other religious orders in Portugal, they used their ancient recipes to make pastries for sale. The Jerónimos monks made little cups of flaky pastry dough filled with custard and topped with cinnamon. All monastery pastries are delicious, but these “pasteis de Belém” are a piece of heaven. The recipe hasn’t changed since the pastry shop opened in 1837, and everything about it is shrouded in mystery. Only three master patissiers, who prepare the cream and dough in the “Oficina do Segredo” (secret workshop), know the recipe. Antiga Confeitaria de Belém, Rua de Belém, 84-92, Lisbon. Tel. 21-363-7423. Email: pasteisdebelem@pasteisdebelem.pt. Click here for website. After reading this, I feel like eating one right away. I tried to reach to the one on my screen but did not succeed to get it. Is there an app for that? There is talk of a new app called app.etite that will allow you to do this. 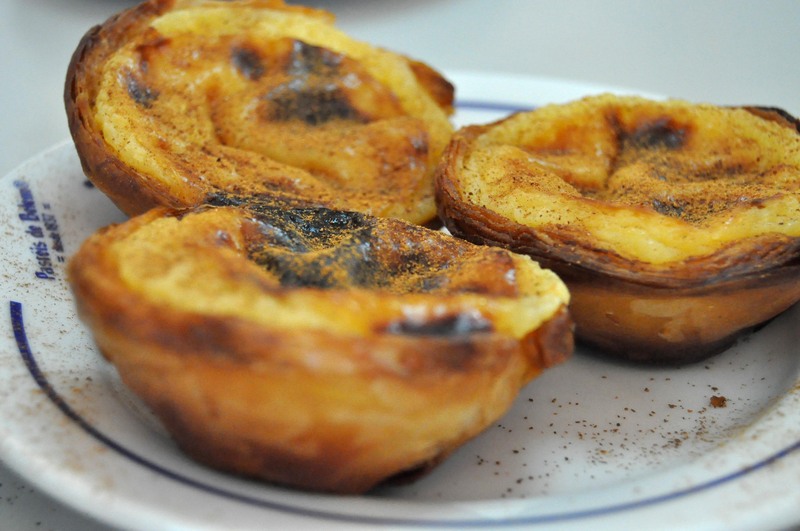 You’re making me want to go and find a nata custard tart for breakfast..! You have described one of the wonders of the modern world! Especially with cinnamon sprinkled over.